NEW VIDEO!! Sweet strawberries and cherries, super refreshing watermelon and mint and just enough spicy jalapeno to lightly infuse the wine. Served icy cold, this is going to be the most popular drink at your next party! 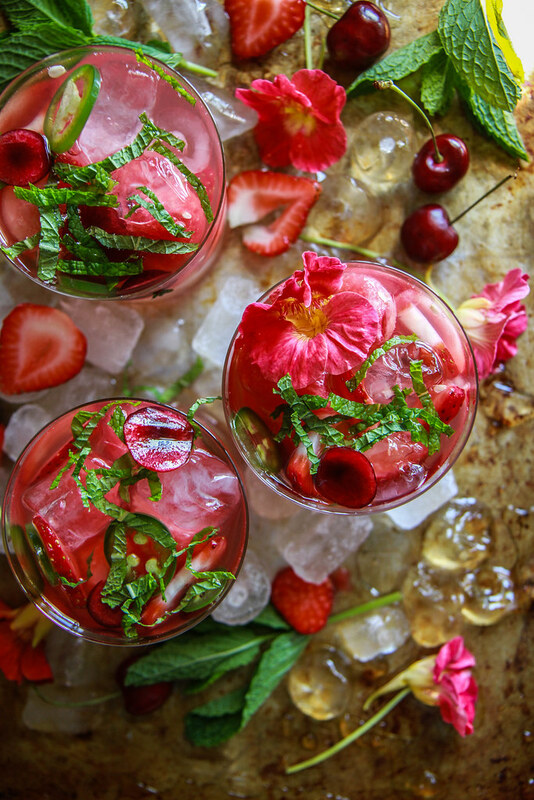 In our family, hot, sunny weather seriously equals Summer entertaining and that means gorgeous cocktails on-demand!!! And I am pretty sure that this is really far up on the list of gorgeous cocktails. I was inspired by my annual Summertime obsession with rosè, and now it has grown and morphed (as everything with me always does!) into my current favorite way to enjoy rosè: Spicy Watermelon Sangria. 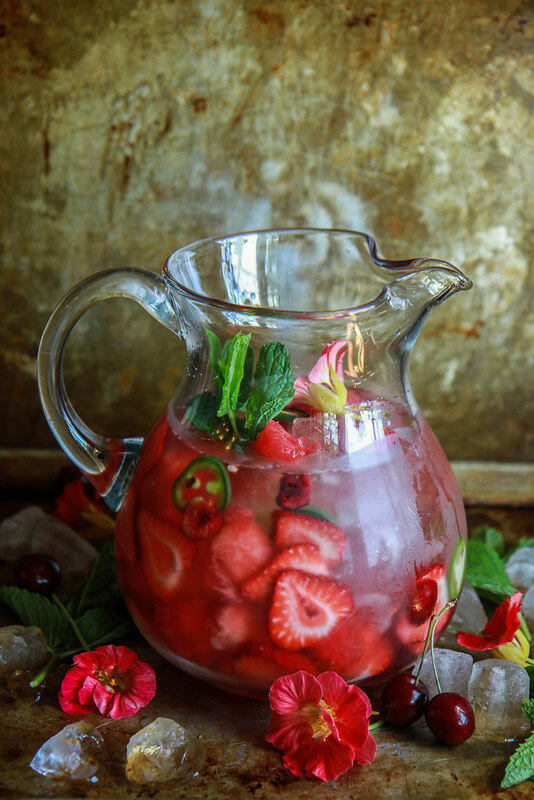 Sweet strawberries and cherries, super refreshing watermelon and mint and just enough spicy jalapeno to lightly infuse the wine. Served icy cold, this is going to be the most popular drink at your next party! Feel like you can play with this recipe a little too- you could sub apricots for cherries, Serrano or fresno chili for jalapenos and bubbly sparkling rosè would be so fun too! Cheers! 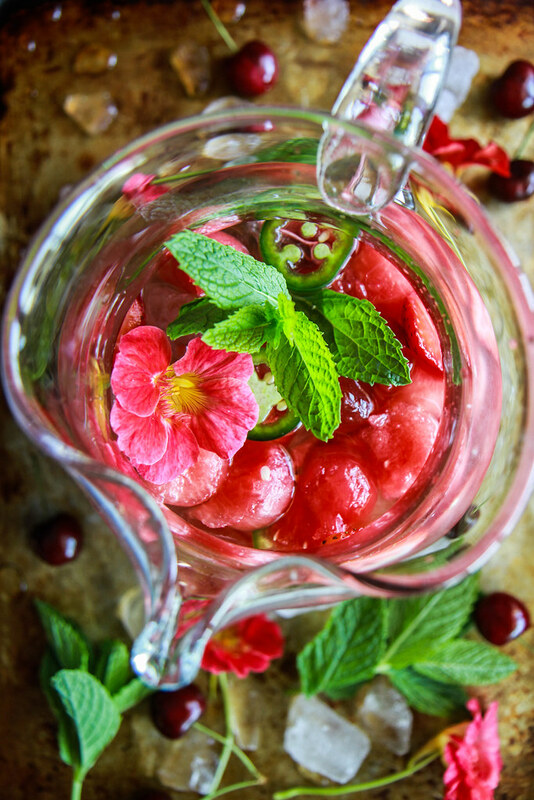 In a large pitcher combine the fruit, jalapeno slices and mint and pour the rose over the top. Refrigerate until the sangria is chilled and the fruit has absorbed the wine. I like to do a minimum of an hour and up to a few hours. Fill the pitcher the rest of the way with ice cubes before serving in glasses. Me too Erin! Thank you so much! Looks like the trip was so much fun! 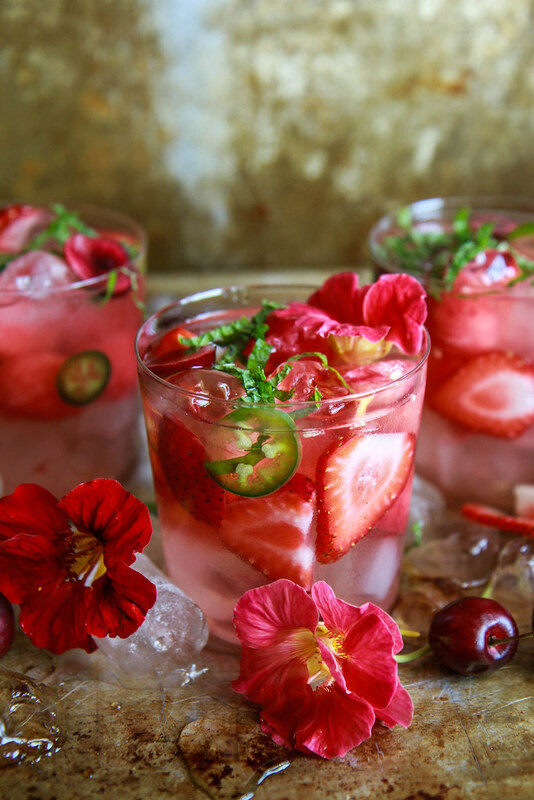 Love this spin on Sangria – I love how you’ve spiced it up too! Thanks so much Jeanine- the jalapeños definitely make the drink! This is so pretty!! I love all of the berries in this and the photos from the Hamptons trip! Thanks so much Lexi- it was a great trip thanks to you! I loved seeing that weekend via IG. AMAZING! so many beautiful friends, food, and um.. WINE! Your retreat sounds and looks like it was super FABULOUS! What an awesome group of bloggers to get to hang with. Can’t wait to try this sangria. I’m all about the rose right now, too! It was a great time- thanks Liz! Another amazing cocktail recipe that I must try ASAP! I will make it for you soon- it’s seriously so good! Thanks Gerry! I love anything pink! I’m coming over for a glass! Seriously looks SO good!